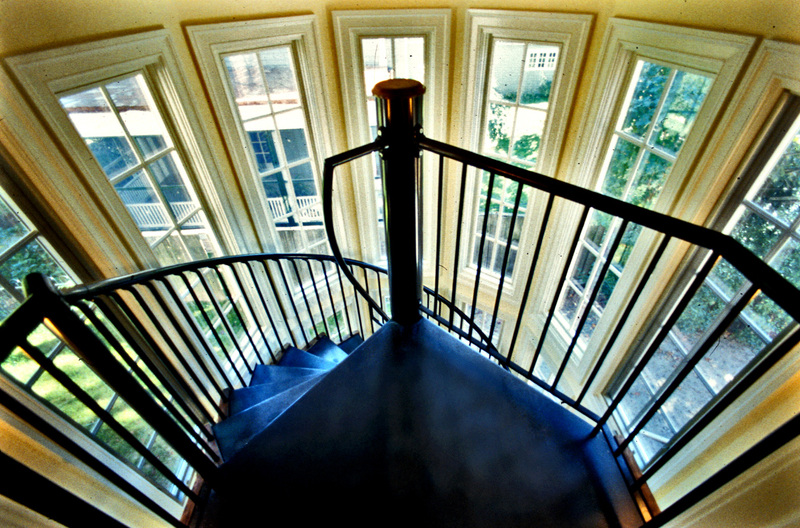 When a recent story on staircases from around the world piqued the interest and curiosity of readers, DCMud decided to explore what the District’s own native sons and daughters of architecture and design could offer to the mix, with results that ran the gamut from edgy to resourceful to sublime. Using materials such as painted steel with Douglas fir, or maple, chestnut and etched glass, area architects have climbed up and stepped out way ahead of the pack, melding the practical with the magical, taking the concept of a necessary staircase to a whole new level. For Principal Bob Wilk off of Archaeon, Inc. Architects, the expanse of the firm’s office building in Cabin John, Md. was limited due to a tight lot. 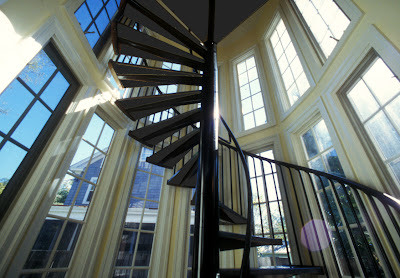 A structure designed to preserve and accommodate an existing 60-foot tall Sycamore tree and restrictive front yard setback demanded a spiral stair, but as it was an office with considerable traffic, the architect made the staircase 7-feet, 6-inches in diameter for comfort. Shop painted steel construction with helix handrails provides contrast to the grid of 49 18-by-18-inch windows. Treads are ribbed industrial rubber flooring. When expanding a 1940s Tudor structure for a family in NW D.C., Wilkoff created a 6-foot diameter steel spiral stair that descends from the second floor master bedroom suite to the first floor family room. 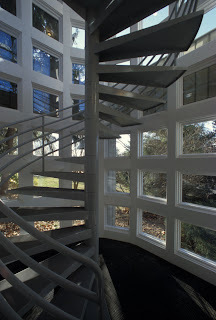 Located behind glass French doors to mitigate sound, carpeted treads in a fully glazed turret complete the airborne design. 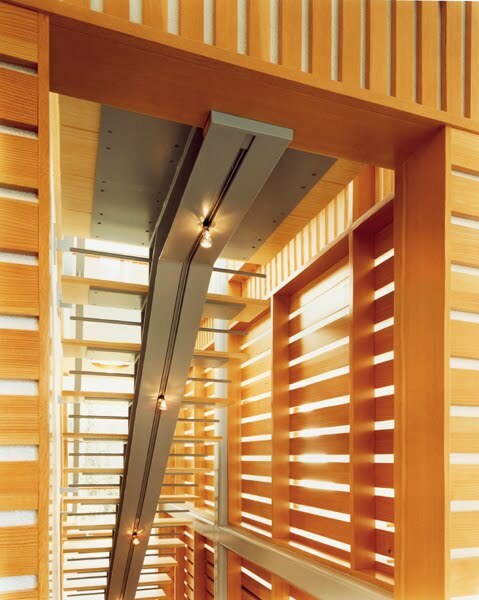 For Principal Amy Gardner of Gardner Mohr Architects LLC, a uniquely renovated 21-foot high 1969 solarium—part of a D.C. residence—called for a staircase redolent of light and lightness. “The idea for the stair was to make a simple sculptural zigzag shape that appears to float,” Gardner said, noting the area under the stair blends into the floor, helping it appear to do so. 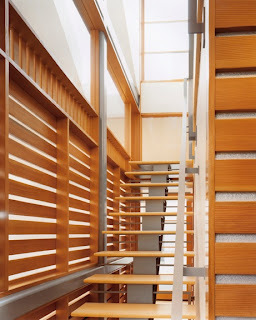 Maple treads and risers with polished edges, and especially a translucent etched glass and steel handrail with stainless steel glass clips, add an additional lofty quality to the design. When renovating a Potomac, Md. residence—essentially a retreat for its occupants—a wooden tower with meditation and massage rooms and a lower level gym were included. 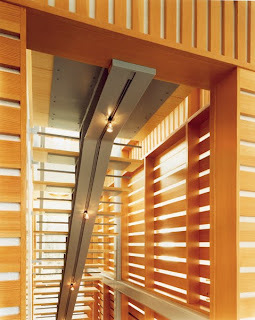 McInturff Architects featured a staircase that connects the home’s three levels made of painted steel and Douglas fir, with maple stair treads, backed with Galvalume sheet steel. 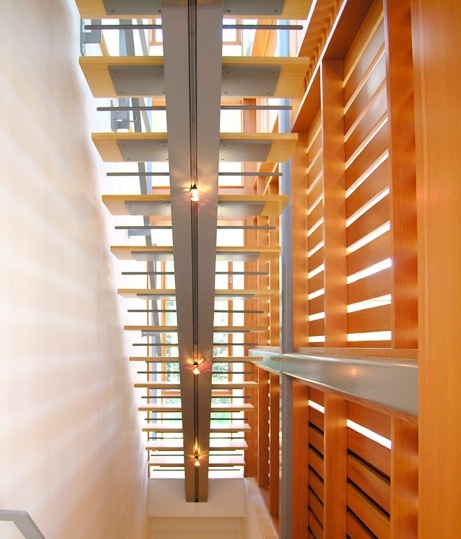 Halo Linea low-voltage track lighting is built into a slot in the steel structure of the stair. In purchasing and reimagining their own “profoundly mediocre” 1960s standard developer-type home in Winchester, Va., architects Chuck Swartz and Beth Reader of Reader & Swartz Architects concede their staircase is the “most curious” on which they’ve ever worked. “You can stand on top of the refrigerator that way, which seems like a ridiculous thing to do, except there are books up there,” Swartz said. Addressing a technical problem with brick veneer on the sides of the building that just stopped at one point, the two gable ends were skeletonized so that they were just studs. Two-by-fours running horizontally were located every four feet, with structural insulated panels on the outside of the building. “We then over-windowed it,” Swartz said. 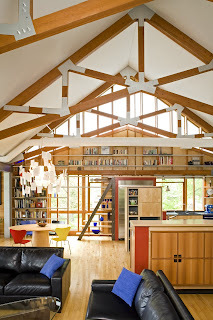 Left with a sk eleton inside on the gable ends, shelves were created off of two-by-two’s that ran horizontally so the gable ends became large libraries. The end without the staircase is served by a rolling ladder from an old telephone building, as Swartz’s father worked for the telephone company. At the other end, a very large refrigerator was obtained as Swartz loves to cook, encased in a birch veneer red-stained plywood box. 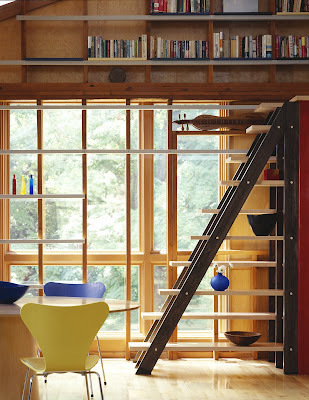 An alternating tread staircase was positioned on the side of it, allowing the occupants to walk up and climb on top of the refrigerator to access all the books. 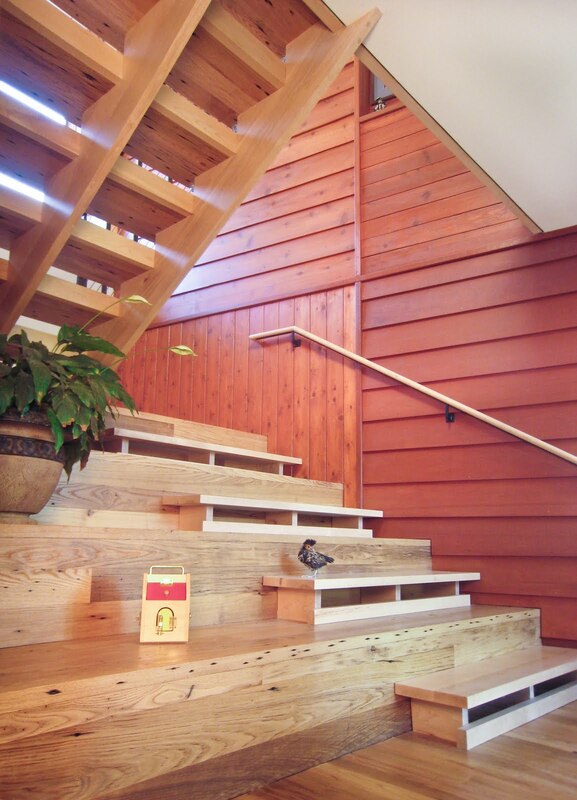 Additionally, the staircase becomes a kind of a sculpture in and of itself, featuring alternating treads and maple shelves as they ascend, held together by red oak that’s stained black. It also acts as a graduated display for art, artifacts and family objects. In Frederick County, Va., another singular Reader & Swartz staircase has several things going for it, among them bleachers made out of chestnut, which is the same as the floor, and which go up to the landing. “They stop so the children in the household can play or you can display things on them,” Swartz explained. In addition, every other tread—the treads that are not the bleachers—are little maple rafts that sit on them and look like small crates. Once you get to the landing, the part that gets you all the way to the second floor is steel and open treads of the same maple. “It’s a way to think of a staircase as a little stage or amphitheater, or a place to sit and think about whether some of the pieces of the staircase can be different than others and still meet the building code,” Swartz quipped. I Know that buying real estate is unique to every buyer and that buying a home is a very personal decision.